It’s important to remember when handicapping this race that all of these horse are running for the $12,500 tag for a reason. Some have run faster speed figures, or have been facing tougher competition, but you would think that their connections would be running for higher price tags if they expected to get back to their better races. With that in mind, I would be careful around short-priced horses such as Lunar Rover and Johannesburg Smile. Both have run races that would beat this field, but it’s somewhat disconcerting that they’re even entered in this race. Erik the Red did win at this level last time out, but you would imagine that Linda Rice, who is known for placing horses realistically, would have moved him up in class if she thought he was going to perform that well again. I want someone else, and I think the right horse is MR. CANADA (#6). He, too, is dropping in class, but at least this is a logical drop. He simply is not going to win for the $25,000 tag, since those horses are better than he. 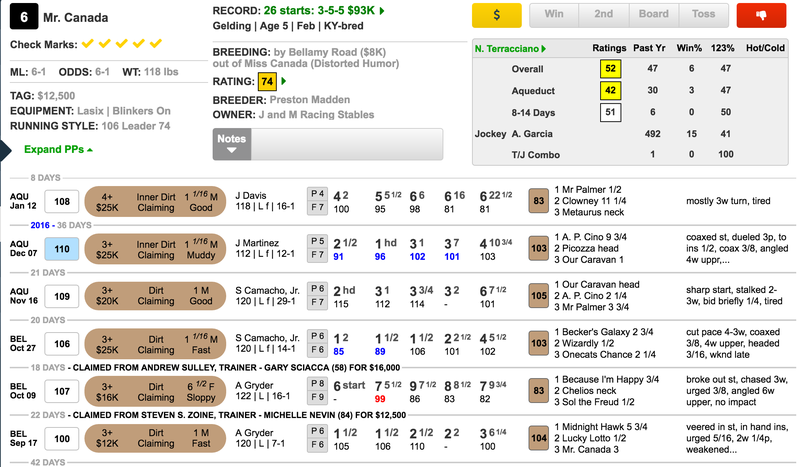 His recent speed figures actually make him competitive against this group, and the TimeformUS Pace Projector is predicting he will be loose on the lead in a situation favoring the front-runner.